Inside you’ll find answers, clarity and how to move forward. Realizing that your marriage is over can be paralyzing. And when the biggest question in your life gets answered, it often leads to even more questions. Those questions often leave us feeling stuck, afraid and alone. …how will I ever explain this to my husband? …will I screw up my kids forever if I do this? …I made a vow. How do I reconcile my decision with the vow I took? The intention for this book is to provide you with some insight and tools to help you navigate this journey and move forward with your life in a peaceful and loving way. Your Answer. Your Life. Your Heart. The realization that your marriage may be over is a tender time, and never does self-care and self-love become more important to your very survival than during this time. And never will there be a time that you will more challenged to maintain a certain amount of inner peace. You won’t feel comfortable. You won’t know exactly what the future looks like. But, you will get through this. The free ebook can help. It’s like a light in the murkiness of your life right now. On page 9, I share how to set the stage for peace when you tell your spouse. 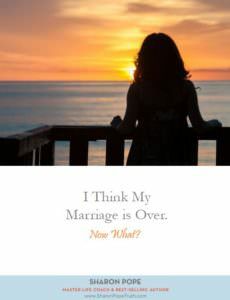 On page 11, I’ll help take the fear out of telling your children by taking a fresh look at what the end of your marriage means and doesn’t mean for them. On page 15, I share how to align your vows and spirituality with your decision. Get the free ebook “I Think My Marriage Is Over. Now What?” It’s designed to help you move through your decision and avoid getting stuck in all the questions. It helps you navigate the journey, deal with the fears and uncertainties, and understand how to move forward with your decision in love.